Infield has been carrying stock at its Schoenthal vineyard since mid-May. While this has been essentially a family affair for Tom and his son, Sid, it has also been beneficial exercise in the vineyard in keeping excess weeds at bay. However, with their sale pending, it was an important exercise to see if the ewes were carrying lambs with the net result that 86% are pregnant. Never mind the three exhausted rams who have been running with the girls for the past three months!! Tom has been careful to make sure the ewes were on a rising plane of nutrition by providing extras such as lupins and oats in the sheep feeder, and lucerne hay the whole time the sheep have been at Schoey. The focus is now on the price these excellent young Poll Merinos will fetch at sale. 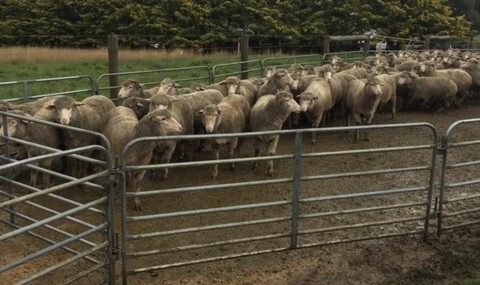 Check out Auctions Plus, the national on-line market place if you are interested in following the fate of the ewes.